The faithful here rejoice and gather to thank God for an unexpected blessing: the possible realization of a plan to restore and rehabilitate a church that is one of the two surviving coral stone churches with wooden floorboards that have survived for at least 140 years. During a thanksgiving mass officiated by Bohol Bishop Emeritus Leonardo Medroso and co-celebrated by Holy Infant Parish priest Rev. Fr. Johnson Inte and vicar Noel Varquez, with Catholic Bishops Conference Chair of the Cultural Heritage of the Church Commission Rev. Fr. Milan Ted Torralba and other co-celebrating priests, National Museum (NM) Assistant Director Angel Bautista read the museum resolution elevating the status of declaration of the Holy Infant Church a notch higher. It was in 2013 that the NM declared same church of the Holy Infant as Significant Cultural Property (SCP), but the declaration is only as a preparation for further study for it to be enlisted as among the country’s Important Cultural Property (ICP). The church, being clearly over 50 years is already considered a heritage structure, based on the National Cultural Heritage Act of 2009 (RA 10066). Former Valencia Vice Mayor Romulo Tagaan shared that the church had organized fund raising anc charity activities to raise funds for the repair of its leaking roof which could damage the church fixtures and the rare floorboards among them. Built by Rev Fr. Mariano Cornago in the 1870’s, it was Fr. Francisco Arcaya in 1882 who completed the structure and the installation of the designed floorboards. The floorboards: a witty combination of 5-inch molave and bayong slats placed one after another in wood parquet design has been preserved. Under the nave to the transepts is a giant flower design with eight pointed petals exquisitely formed from laid woodwork, with the unmistakable direct attribute of exemplary cultural value and gets people nowadays a glimpse or the advancement of the crafts and skills of workers during those times, described NM Bautista who read the declaration immediately after the thanksgiving mass. Through Museum Resolution No. 20-2017, Architect Manuel Maximo Noche, Professor Regalado Trota Jose, Rev. Frs. Rene Pio Javellana and Milan Ted Torralba stated that the preserved wood flooring of the Holy Infant parish Church is an architectural marvel and a priceless legacy representing the people’s respect of the bygone era od builders and designers. The flooring woodwork possesses exceptional architectural, engineering, cultural and artistic significance reflective of the nation’s history. A church that still shows coral stones in its walls and façade, has undergone facelifts in the past, but what remained as the church’s rare treasure it its antique floorboards, according to parish priest Fr. Inte. While the church still displays the usual cruciform lay-out, it too has a façade that is as tall as a four-storey building, two pyramid towers, with steep roofs and arched ceilings. 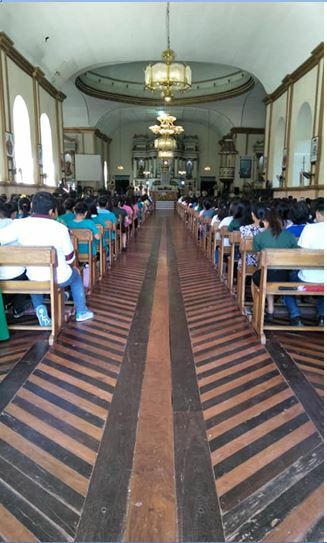 Over the above considerations, the NM which is also mandated to declare cultural properties in relation to their unique historical and architectural values in line with the promotion of the protection and preservation of the church as part of the significant built-heritage thus resolved to elevate the protection classification of the church and its complex into an ICP, Bautista told the parishioners. With the ICP declaration, Valencia Church and its complex gets priority government funding for protection, conservation and restoration; its private support of conservation and restoration can get an incentive from the Commission’s Conservation Incentive Program for national cultural treasures, he explained. Moreover, the declaration also allows the putting of an official heritage marker indicating that the immovable cultural property has been identified as national cultural treasure, or national historical landmarks, sites or monument. Finally, in times of armed conflict, natural disasters and other exceptional events that endanger the cultural heritage of the country, the declared ICP can be given priority protection by the government.